Anyone with a baby learns very quickly what a pain it is to wash crib bedding all the time. Sometimes messes, spit ups and blowouts can be multiple times in the same day (can you tell I’m a new mom?) I personally hate washing crib bedding, its not so much the washing as it is the putting the darn crib back together. Who knew you would have to take the bumpers off and lift the mattress completely out, all to change one sheet? Here is a tip I picked up at the hospital (where there are professionals) so you know its legit! I noticed they use cotton lined plastic mats to help them keep the bedding dry and minimize laundry. I realized the mats they used in the hospital are very, very similar to the doggie potty mats I use for my little dog Indie. I buy the 19″ x 19″ ones at Walmart 50 mats for $10. These little mats have been LIFE SAVERS! (That is, if your life consists of the monotonous chore called laundry.) 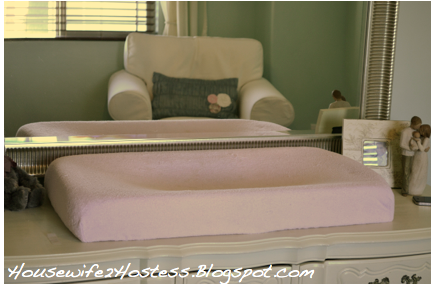 I started using them under the changing pad cover as well and it has been wonderful! For a new mommy like myself, these kinds of things have made all the difference.